Our experienced staff and extensive equipment allow us to offer full intensive care treatment of even the most complicated, high risk cases. 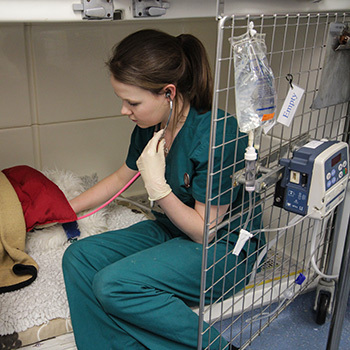 A full range of intensive care incubators and high dependency heated kennels are used to care for and treat critical and intensive-care cases. Our intensive care facilities are supported by a full range of intensive care equipment from patient warmers, infusion pumps, blood transfusion and syringe drivers to full kennel-side patient monitoring machines measuring vital signs, such as temperature, blood pressure, ECG, patient oxygen and carbon dioxide levels. Our isolation kennels, with separate drainage and ventilation, allow the safe care and nursing of patients with infectious diseases. A range of incubators and vivarium provide additional intensive care facilities for neonates and small patients, allowing the accurate regulation of temperature, humidity and oxygen levels. These facilities are supported by our 24 hour on-site nursing care ensuring that our patients can be treated and monitored round the clock any time of day or night.